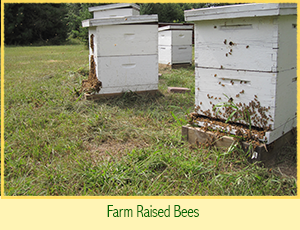 Farmer Doug has been beekeeping at Waldoch Farm since he was 14 years old. He learned the ways of the Minnesotan beekeeper from Grandpa Dan. We still receive sage advice from Grandpa Dan’s brother who has been professionally beekeeping in Florida for the last 50+ years. At Waldoch Farm we extract honey twice a season, one in late July called Clover Field and one in late August called Sweet Harvest. This allows us to capture the unique flavors of Waldoch Farm. The July extraction is timed just before the goldenrod bloom, so that it has more of a clover taste. 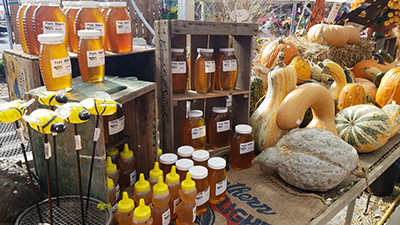 The goal is to have this honey available at the Roadstand by the Garden Tour each year. The August extraction has more flavors from the produce on the farm –we’ve had some people say that they can taste hints of peppers or squash. The goal is to have this honey available in time for Fall Fun season.